While the Pear Vanilla jam was cooling, I turned to use the remainder of the pears for Food in Jars’ Pear Cinnamon Jam. 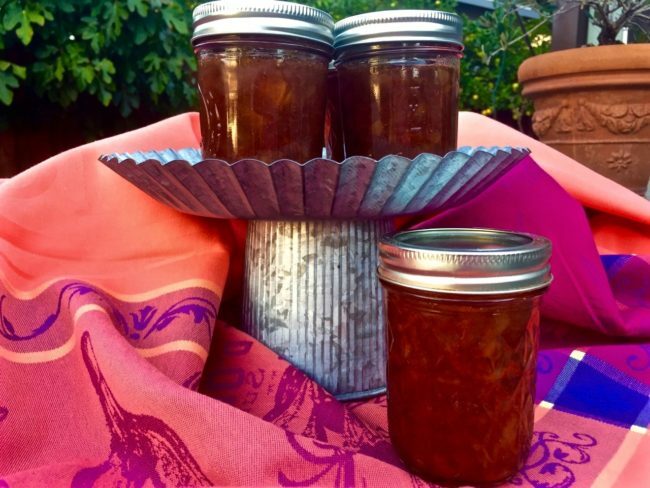 If these two recipes are any indication of how good they are, be sure to check out Marisa McClellan’s Food in Jars blog for lots of good recipe ideas! I love cinnamon, and I’m usually of the opinion that more is better. 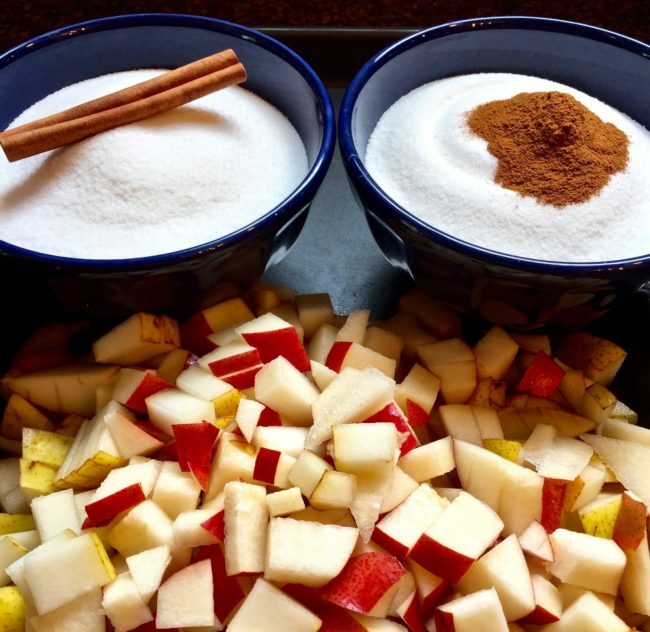 I was torn between using just ground cinnamon or a cinnamon stick or both. Reviews of various recipes seemed to think it was better to go light on the cinnamon so as not to overwhelm the pears. I decided to go with the original recipe using one tablespoon. Also, as I didn’t have a lemon, I used the liquid pectin. My first batch was more cinnamon than pears, so I tried again with a tad less cinnamon so you can taste more of the pears. As noted on the prior post for the vanilla pear jam, I used Bartlett pears which are sweet, thin-skinned, and were on sale. This recipe called for 8 cups which, in my experience of making about five batches so far, turned out it was about 2 cups per pear. As that will vary depending on the size of your pears, buy five large pears to be safe. I like the chilled plate method to test for doneness which calls for placing a couple of small plates in the freezer, when you think your jam is close to being done, put a small spoonful on the chilled plate and wait a couple of minutes to see if the surface forms a skin and seems to be getting more solid. If it does not, continue cooking and checking every couple of minutes. I freeze a couple of plates as it usually isn’t quite ready the first time I check. In a large, heavy-bottomed pot, combined chopped pears, and sugar. Cook over medium heat until the fruit can be easily smashed with the back of a wooden spoon. This took about 15 minutes. 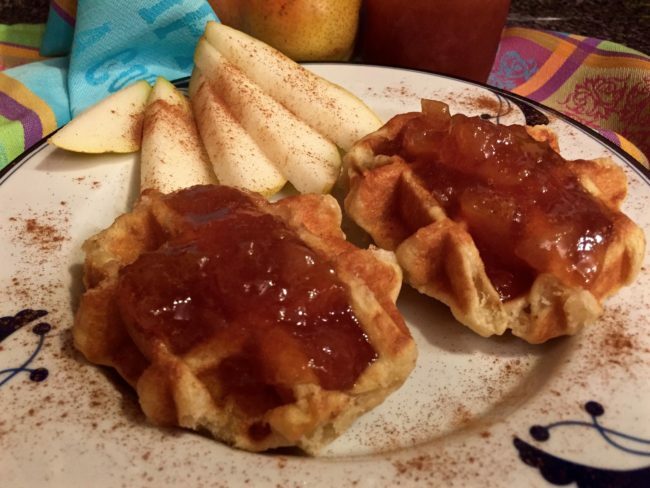 Use a potato masher or immersion blender to break the fruit. I like the chunkiness of this jam, so I did not mash it up very much. Add the cinnamon and liquid pectin and stir to combine. Bring to a rolling boil. Let boil for a full five minutes to activate the pectin, so that the finished product will have a nice jammy consistency. Every batch of these pear jams I have made took much longer to set (about 15 minutes). I have learned that depends on a number of factors including the weather and elevation, so be sure to have plenty of chilled plates on hand to check for doneness. Before jamming, sterilize your canning jars and bands in a large pot of boiling water. I leave my jars on a low simmer while the jam is cooking so they remain warm. Wash the lids in warm, soapy water, dry and set aside. When the jam is ready, carefully remove the jars from the hot water with tongs. 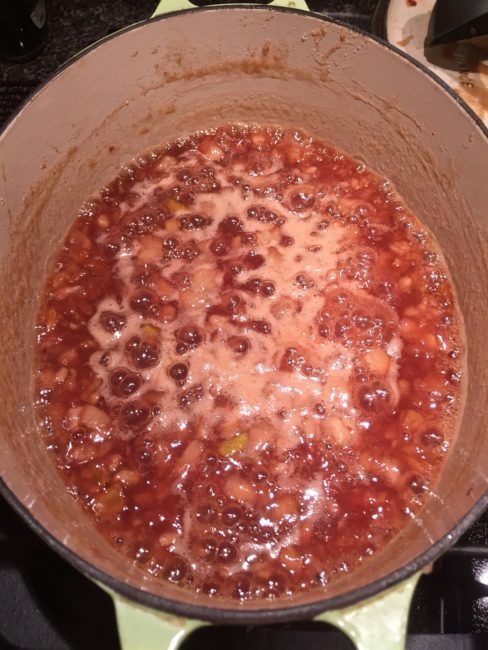 Ladle the jam into the warmed canning jars leaving ¼” space at the top of the jars. Run a knife around the inside of the jars to remove any air bubbles. Wipe jar threads and rims with a clean damp cloth, so they don’t stick shut. Cover with lids; apply screw bands until fingertip tight (don’t over tighten or there is no room for expansion). Process the filled jars in boiling water for 10 minutes (start the timer when the pot has returned to a boil). Carefully remove from water and let cool completely on the counter with a rack or towel underneath. That pinging you hear is a sign of a good seal. However, you still need to check the lids. 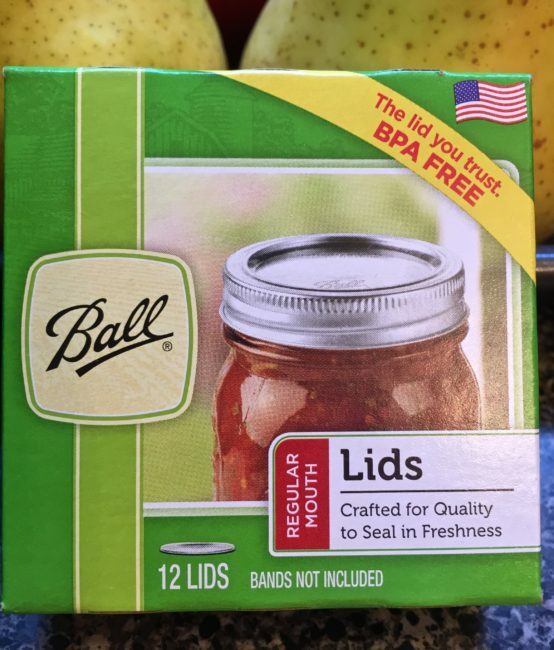 Paraphrasing from the Ball Canning guide: To check the lids have sealed properly, they should not flex when pressed in the center. Remove bands. Try to lift the lids off with your fingertips. If it can’t be lifted off, it has a good seal. Replace the bands and loosely tighten. Just a note about canning, if you are new to canning as am I, please be sure to read the Canning 101 from either Ball or Food In Jars for food safety and how to can correctly. For example, I had not considered that you should not reuse the lids (bands are fine to reuse) and was pleased to learn a box of 12 new lids costs only a few bucks at the hardware store.